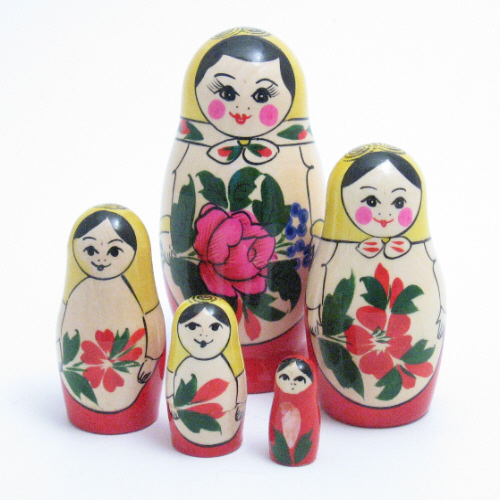 The most frequently asked question about Russian Dolls is how did the tradition begin?. As ever with these things there are different answers but one explanation is sufficiently far fetched to be believable. Around 1890 an artists commune to the North of Moscow in the village of Abramsova was owned by a merchant and patron of the arts called Sava Mamontov. They had meetings each Saturday at which they exchanged ideas as to what things they should produce. 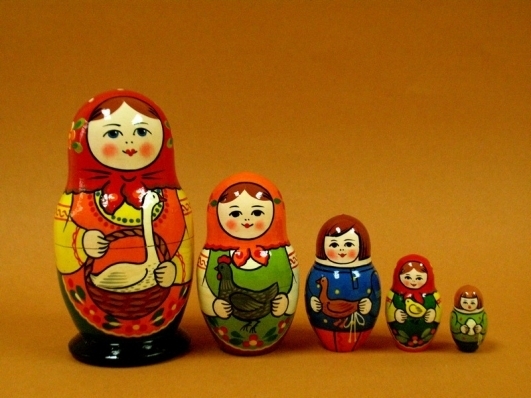 One day someone produced a nesting doll of a jolly bald headed man with some other figures inside. It had been brought from Japan and the legend states it was made by a Russian monk on the Island of Honshu. Some say that this doll was actually brought back by the wife of Mamontov from a trading expedition. The doll was called Fukuruma. Turning nesting objects such as Easter eggs was not new to the Russian woodturners but the idea of a doll was something different. Two artists were commissioned by Mamontov to produce a doll in the Russian style. Vassily Zvodochkin turned the pieces and Sergei Maliutin painted the design. Far from being the young girl we see as so traditional the first doll was a family group with the smallest piece being a baby wrapped in traditional swaddling. Part of this commune was in fact a toy workshop so it is not surprising that other artists picked up the idea and began to produce more matrioshka. The break through for the new toy came in 1900 when the dolls were shown at the World Exhibition in Paris. The new toy won a prize and became internationally know. By 1904 a workshop had opened in Paris and was the first to sell the dolls commercially outside Russia. By 1911 dolls were sent from Russian factories to 14 different countries around the world. Attempts were even made by German and French toy makers to produce the dolls but these did not last. The Revolution brought about an abrupt end to the production of Matrioshka in Russia and it was several years into the new regime before they were manufactured in any number. In the next ssection we look at the way production was developed in various centres in Soviet times. The oldest dolls we know of in the country, thought to be from the mid to late twenties are at Wightwick Manor in Staffordshire which is owned by the National Trust. 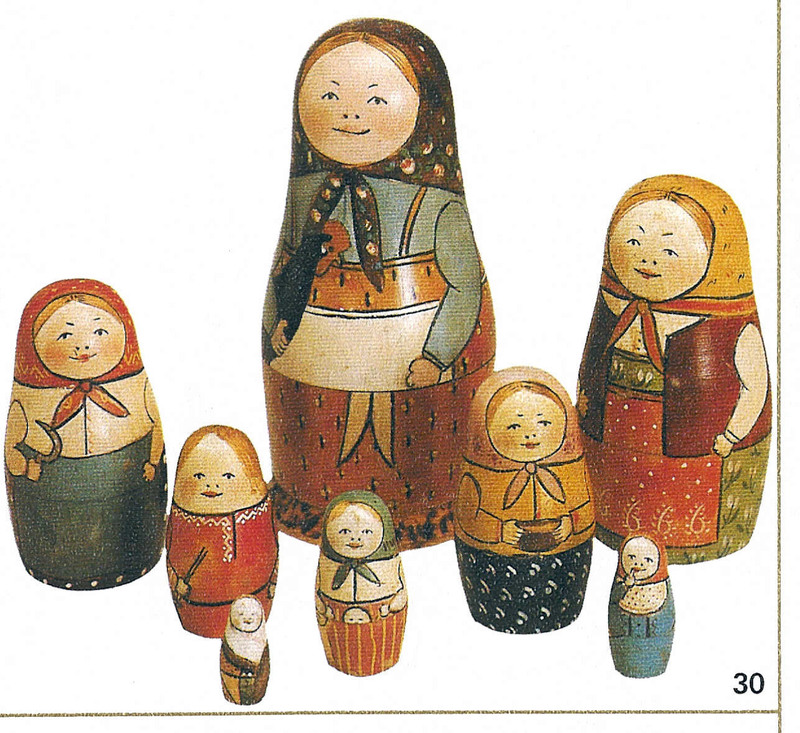 If anyone knows of any pre-war Russian dolls or has one in their collection we would love to see a picture. After the Revolution in Russia there was a period of about 10 years when the whole population struggled for survival. The emphasis was on production of essentials not the more frivolous items. For this reason the 1920's era was a quiet time in Matrioshka production. Towards the end of the decade things changed and various factories began to produce dolls in substantial numbers. As in all other aspects of Soviet life production was controlled and the Semyenov factory was chosen as the one which would be allowed to export most of its production, which is why many people believe that this simple Smyenov doll is the "original". The factory at Cergiev Posad, then Zagorsk, eventually called Toy Factory No. 1 produced dolls mainly for sale in the Beriozshka shops (Shops which took foreign currency and used mostly by tourists) as did those at Kirov, Polkhov Maidan and Lipyetsk. Most of the production during this time looks very similar although it is possible to identify where a piece was made by the design. The design had to be simple to allow for mass production. It is worth bearing in mind that this system extended to all Handicraft products including the world famous lacquer boxes, shawls, painted trays and many other items. It was in effect a crime to paint a doll and sell it for yourself, all items went to the Berozshka shops or other specialist outlets which controlled sales and prices. There are stories of electricity being cut off in areas where people attempted to produce their own items. Police controlled the movement of goods at railway stations and entry points to towns. Despite this a few enterprising individuals did manage to produce their own dolls but these were normally sold to private collectors and are very rare. Only with the changes of the mid 1980's did the situation alter. Controls on the activity of individuals was relaxed and those artists with any talent soon took the opportunity to sell their product on the open market. Although perestroika means rebuilding or changing, the period since the end of the Communist system has been very hard for the former factories. Toy Factory No. 1 at Sergiev Posad formerly Zagorsk closed shortly after Perestroika although it has now reopened as a private concern. 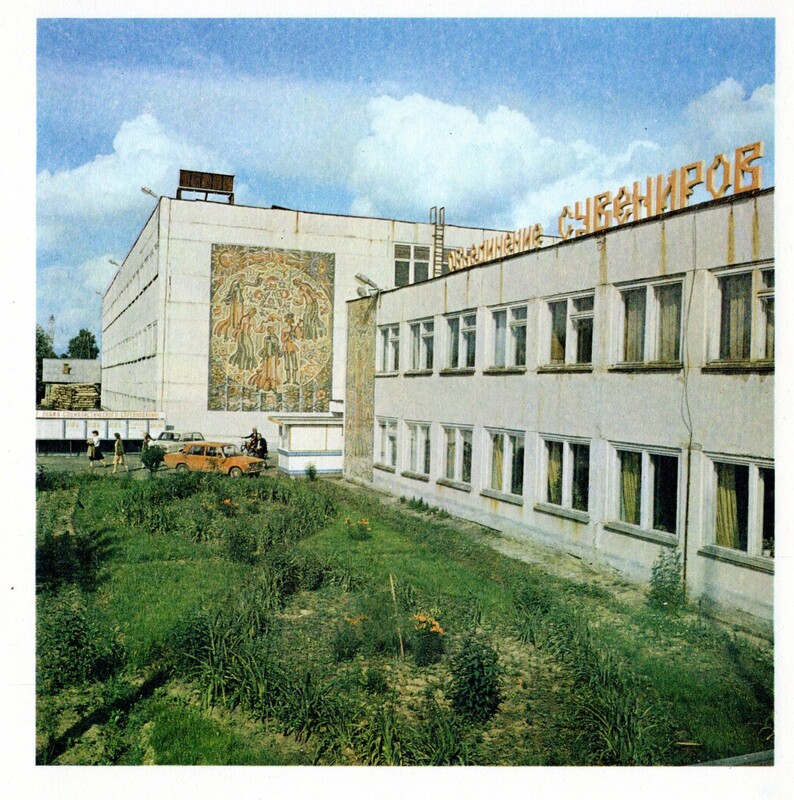 The only other factory now operating is th Semyenov factory near Nizhny Novgorod although this has amalgamated with the Hochlama factory in the same town. As soon as artists became free to express themselves and sell their own work for profit they did so. A clear manifestation of this was the famous “Gorby” doll produced in thousands and in as many different qualities. But not everyone could benefit from this change. Sergiev Posad is only about 70 Kms from Moscow with easy access to the tourist markets but Polkhov Maidan and Semyenov are around six hours’ driving away. (Old Arbat Street) were not all they seemed. Many of the ‘artists’ selling dolls and souvenirs were in fact students hired by a small group which controlled the entire operation. When President Yeltsin closed the Old Arbat Market it was a brief and small attempt to stop crime. Today these controlling groups concentrate on tourist markets, selling pitches rather than individual items. The rapid increase in the number of artists selling their own work in the markets has created a very confused situation as they produce new designs as well as ‘copying’ traditional styles from other regions making it almost impossible to tell from the design where it was produced. There are several areas of production, the major being around Sergiev Posad with co-operatives also working in St Petersburg, Ryazan and the area around Nizhny Novgorod. The work produced is of differing quality, from the worst to the very best. Many of you will have seen the book by Larissa Salieva which illustrates much of the best work now being produced. Unfortunately there is now a trend to “Westernise” production with many of the faces moving away from the simple maiden style so that they appeal more to the American market. One thing that can be said in the post Communist era is that the Matrioshka is as popular as ever and there are many artists earning a realistic income by using their individual talents. In Russia today there are a lot of very talented artists producing a wide range of designs and styles of Matrioshka. The problem for artists now is that they have to sell their work to survive, rather than receiving a state income as happened under the Communist system. Twenty years after the big changes there are still artists working who grew up under the old system and still produce either as individuals or in collective groups. Those who work as part of our collective groups know that they will have regular work and a regular income. Those who paint as individuals sell their work through tourist markets but this is really only possible if they live close enough to Moscow or St Petersburg. Others sell their work through ‘agents’ who operate in the tourist areas. These intermediaries usually try to give the impression that it is their own work they are selling. There are a few extremely talented artists whose work is so special they have a waiting list. I have one such doll – very expensive but very special. There is little incentive for young people to follow this profession and many of them regard this part of their culture as too ‘folksy’. They want to be more like young people in the ‘west’ - up and coming professional business people with a life style to match. This is understandable but the country has a long way to go before even a reasonable proportion of people can attain this ideal. There is also the possibility that demand will eventually fall away although it is clear that the matrioshka industry is still thriving in Russia today. We believe that the production will gradually fall into two groups – the more commercial production for the mass market either in factories like Semyenov or in small workshops around Moscow and St Petersburg and, at the other end of the scale, there will be a few artists producing work of the highest quality. We will have to wait and see how things develop.